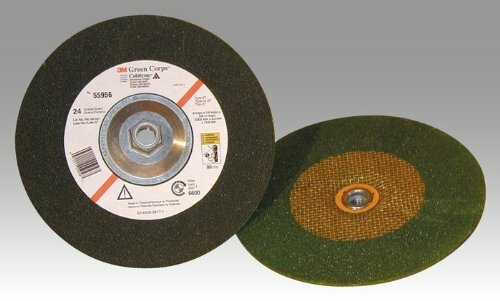 3M Green Corps depressed-center wheel uses ceramic as the abrasive material and has a diameter of 4 in. 3M incorporates this ceramic material into the depressed-center wheel forming a grit of 24. In addition to the other aspects of these parts, another important component of these is the thickness. This 3M part is 1/4 in thick.